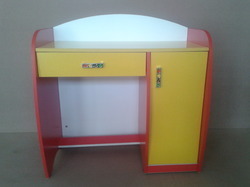 Study Table (900mmW x 418mmD) with Table Top height 750mm and back height 910mm. 18mm thick Pre-Laminated Particle Board with PVC Edgebanding Tape on all exposed surfaces in attractive colour combinations. ?? Looking for STUDY TABLES ?